I’ve been watching with interest all the recent outrage over Murdoch’s attempts to influence next week’s General Election result. That’s mainly because, while for some people the shenanigans of the right-wing press have come almost as some kind of revelation; for me, and I’m sure for plenty of others like me, these latest stories concerning News International don’t come as any surprise. They simply confirm what we’ve known about the evil empire for decades. As are the Tories of course. 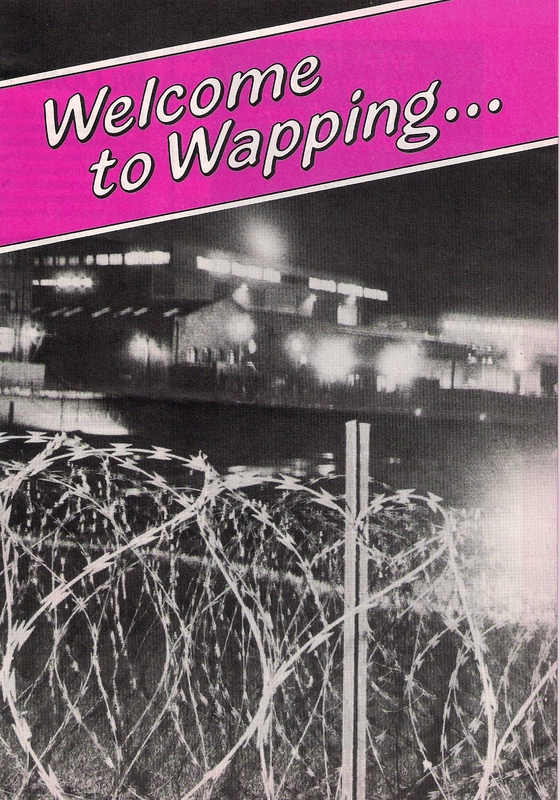 When the Wapping dispute started back in 1986 I was neither a print worker nor a journalist. Instead I was a young Labour Party and trade union activist; so when the call went out for comrades to come down to London and show solidarity with the sacked print workers, I was one of the first into the back of the transit van. And that’s one of my enduring memories of that dispute: Saturday nights in the back of a transit van; barrelling down the M1; sneaking into London, and then parking up on some side road in Tower Hamlets, all the while hoping and praying that we wouldn’t get pulled over by the police. 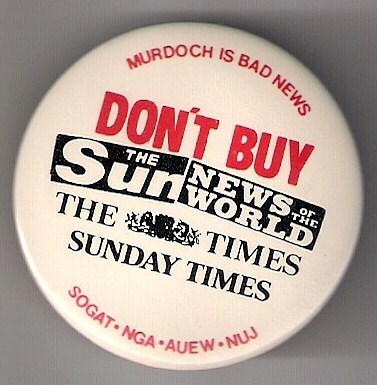 Back then I suppose I was part of what the right-wing press liked to call the rent-a-mob crowd, even though I wasn’t there looking for trouble: I was simply another trade unionist doing my bit to stand up for workers’ rights. As were the majority of other people who got in volved in that dispute. To them, the trade unionists were nothing more than a mobof “leftie extremists,” out to wreak havoc and destroy the state. “The dimension of the unseen human tragedy was shocking. We had people who came with their families, their children; they wanted to take part in a peaceful demonstration. They wanted to say to Murdoch, “You’ve not only done this to me, you’ve done it to my wife and kids.” But the Metropolitan Police clearly had other instructions. They were there to protect the newspapers, to see that Murdoch got the Sun out, and the rest of his publications. We called them “paper boys”, and that was exactly what they were. With local polls and a couple of by-elections looming, he has been desperately seeking to give Labour a new face – moderate, responsible, respectable. Even the colour red has been dropped from party platforms. But another face of Labour was on display this weekend, and it was ugly, envious and hate filled. Outside our printing plant was a howling, jostling mob of some 7,000 so-called pickets. Their purpose was to deny this company its legal right to carry on its business, and to deny hundreds of workers their legal right to earn a living. But for the protection of the police, they would undoubtedly have stormed the building. In their frustration, they hurled smoke-bombs and pelted police with every kind of missile. If you are waiting for Mr Kinnock or any other Labour leader to denounce this grotesque and wicked travesty of the truth, you will wait a long time. For the past three months they have been actively encouraging the campaign of blackmail and intimidation against us. Mr Kinnock has never had the courage to denounce the violence, just as he never dared to denounce the violence of the miners’ strike until Arthur Scargill was safely defeated. In office, what would Labour do about the thugs of industry? Again, we can tell you. Mr Kinnock’ss side-kick, Roy Hattersley, has been down on his knees to the union bosses. In return for their support, Labour would scrap the laws which allow companies to run their businesses and workers to decide where they take employment. Law and order? That would be in the hands of Gerald Kaufman as the socialist Home Secretary. We can also tell you about Mr Kaufman. His first instinct when there is trouble – whether in factories or in high immigrant areas – is to put all the blame on the police. Vote Labour? Vote for riots and anarchy? We hope that the beast at the gate will be a terrible warning to you. Please don’t be fooled! It makes today’s efforts seem almost tame in comparison doesn’t it? But that’s Murdoch for you: the shite his papers are spewing today is simply the same old same old shite they’ve always spewed. And as for “the beast at the gate.” I think we all know who that is. 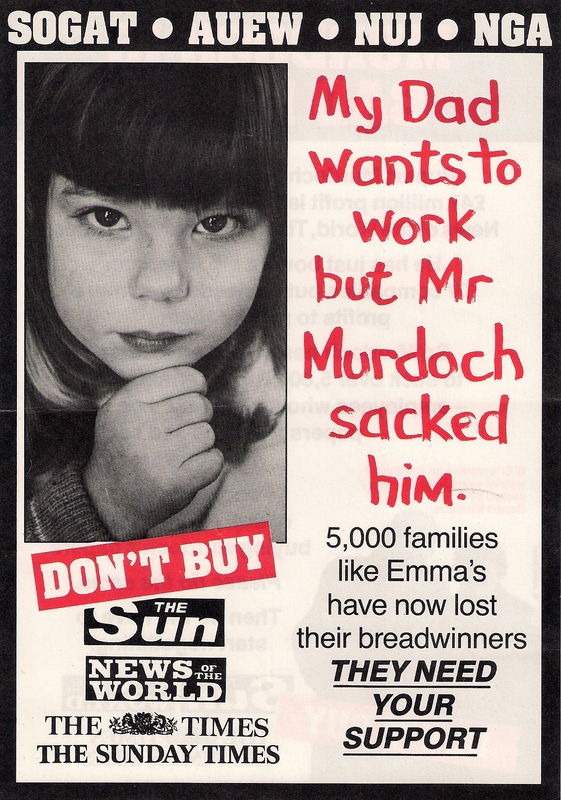 Vote against Murdoch on May 6th. Keep the Tories out! *Click here to see Wapping and the Wire, a film about the dispute that’s hosted on the Socialist Party website, and that was filmed on the one-year anniversary – it’s about 25 minutes long, so if you haven’t got time to watch it all, fast forward to around 17 minutes 47 seconds in, where you’ll see Tony Benn’s reaction to the police brutality going on in the background. And yes, I was there that night as well. Indeed it’s the Murdoch press trying to control the election and that’s scary! I too went to Wapping, I had one of the SOGAT/NUJ/NGA/AUEW posters on my bed wall. 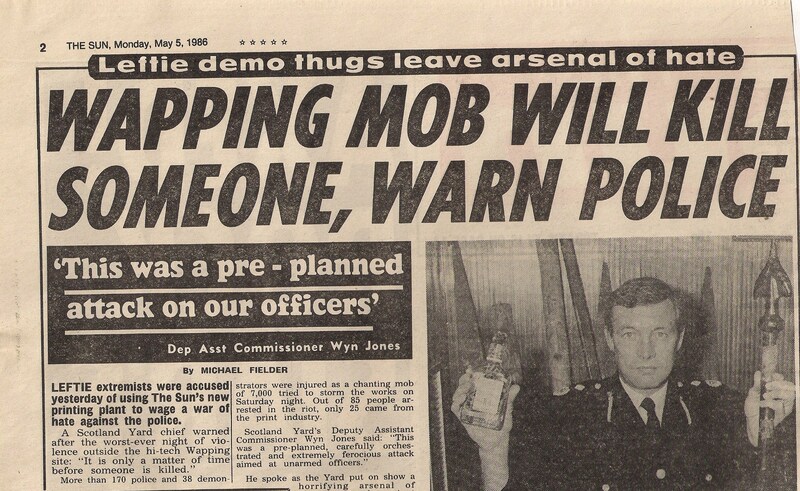 I was there on the night of the 1st anniversary in January 1987 and it was unrelenting police violence and brutality (and the lies the media reported about the protesters parallels with the Miners’ Strike). I had only just left school and had wanted to go to the May Day demo in 1986 but my exams were coming up. But that night in 1987 was a real eye opener I knew the police were violent (I had seen countless reports about their brutal antics in the Miners’ Strike) but it was up close and personal witnessing friends and comrades being beaten up, riot cops was smashing anything and everything up (they smashed up the make shift ambulance). I recall being utterly scared and only missed being batoned by a cop on horseback ‘cos someone (I still thank whoever they were to this day) by someone pushing my head down and saving my head from a whack! And of course The Sun’s disgusting coverage and reporting of the Tottenham Three case, absolutely and utterly vile along with Hillsborough and the lies they peddled. Murdoch’s press is pure gutter …. Have you seen Craig Murray’s blog? He called out YouGov on their blatant poll-rigging in favour of the Tories and the Murdoch Party, and they tried to get his web host to shut his blog down entirely. Whoops. Things don’t really change do they? Unionists and striking workers will always be demonised by a right-wing press, as will anyone who is prepared to actually take action against that which is unjust. But have you seen that the Guardian has come out on the side of the lib-dems? Interesting no? Ah, memories, memories! I spent the Wapping dispute as a journalist on a local daily in the East Midlands. I remember wandering around the otherwise deserted newsroom in the evenings using the autodial on our phone system to block Wapping’s switchboard, back in those pre e-mail days, to stop their copy getting through. And deeply criticising the Sun’s NUJ FoC for strike breaking in the local Labour club (he was also the PPC, a sign of things to come?). No, I was surprised the Times hadn’t come out for the Tories months ago when the Sun switched. The Guardian’s move was more interesting.